Articles from around the world this week: electrical power sources in Australia, oil and gas drilling expansion in the USA, effects of shrinking glaciers on communities in Central Asia, and the Presidency of the next COP meeting in Chile. We all know that rooftop solar has gone through the roof in Australia and that Tesla has installed a massive battery for the grid in South Australia but what is now becoming clear is that Australians also have a very positive approach to home batteries. A report by Bloomberg New Energy Finance predicts that 70,000 homes will install batteries in 2019, assisted by state government policies and subsidies, and a new federal government subsidy if Labor is elected. Australia will be the biggest market in the world for home batteries, accounting for about 30% of sales. Apart from anything else, what this indicates is that consumer demand plus supportive government policies can effect rapid changes in behaviour with beneficial outcomes for individuals, society and the environment. Time series pictures of glaciers retreating as the world warms are a dramatic sign of a changing environment but does it really matter if there’s a bit less ice in remote mountain ranges? Well yes, of course it matters greatly for the river systems and people who are dependent on the annual spring melt if a glacier eventually disappears completely. This article, with tremendous videos and photos embedded in it, is by two New York Times reporters who travelled to Central Asia to look at the research being done on shrinking glaciers and their river systems and to understand the effects on ecosystems, agriculture, sea levels and people’s lives. Perhaps the NYT could send the reporters to Menindee next. The USA doesn’t only intend to withdraw from the Paris Agreement on climate change and roll back domestic environmental laws, it is also planning to massively expand its oil and gas production. Oil Change International and 17 partner organisations have released a report, Drilling for Disaster, which explains that between now and 2030 the USA will be responsible for 60% of the growth in global oil and gas production, and will produce enough oil and gas to use up nearly 50% of the world’s total oil and gas budget if we are to limit global warming to 1.5oC. At the end of each year the world’s nations meet for two weeks, at the somewhat obscurely named Conference of the Parties (COP), to discuss climate change: what’s happening and where are we going? The two COPs that stand out in many people’s minds are the disappointing one in Copenhagen in 2009 and the one that nutted out the Paris Agreement in 2015. The President of each COP, nominated by the host country, plays an incredibly important role in not only the success, or not, of each meeting but also in creating its ‘mood’. Laurent Fabius, the French Foreign Minister and COP President in Paris, was enormously influential leading up to and during the Paris meeting. Chile, the host for the 2019 COP, has nominated its environment minister, Carolina Schmidt, as President. Ms Schmidt has a broad background but seemingly little experience in environmental issues, although that is not a prerequisite for a successful Presidency. 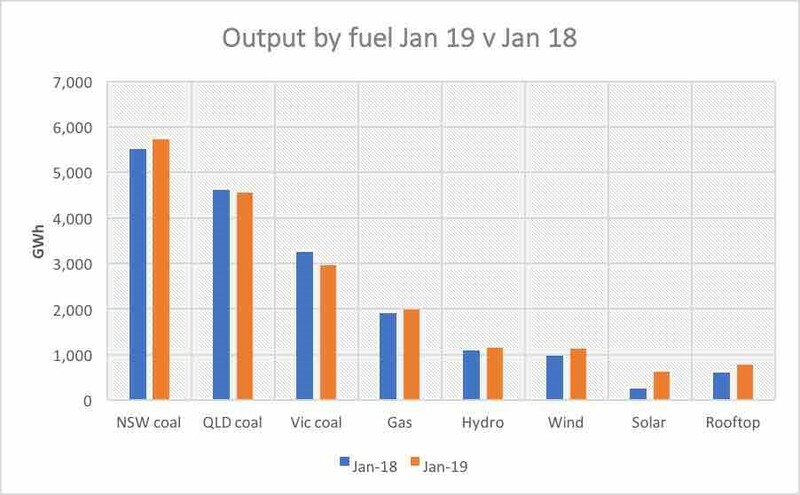 My graph this week compares the combined eastern states’ electricity fuel sources in January 2018 and 2019. We are right to be encouraged by the falling price and expansion of renewable energy sources, particularly solar, but the fact remains that coal and to a much lesser extent gas continue to dominate our sources of electrical power. 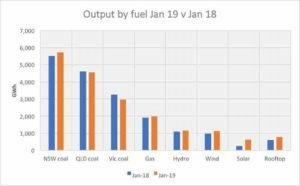 Only the unreliable Victorian brown coal power stations produced significantly less output in 2019.